In 1897 Trego was commissioned to create a funeral monument for the deceased Anthony Shimer of Phoenixville, Pennsylvania, who had left a sum of money in his will with the stipulation that it be used to create his memorial. 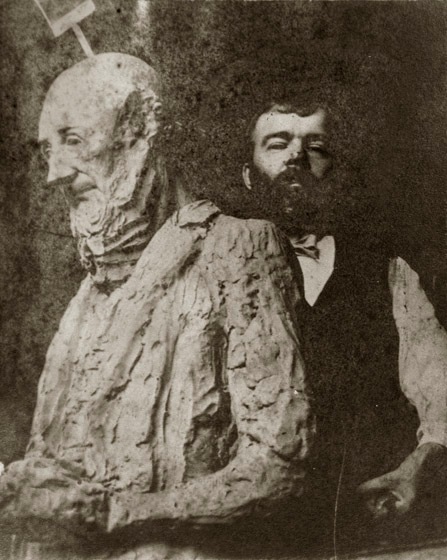 This photograph shows Trego in his studio with the full size clay matrix for the statue. It is the only photograph that shows a glimpse of Trego's left hand, which seems tightly clenched around a carving tool. Only the thumb and forefinger of this hand could be moved. The rest of the fingers were frozen in place.